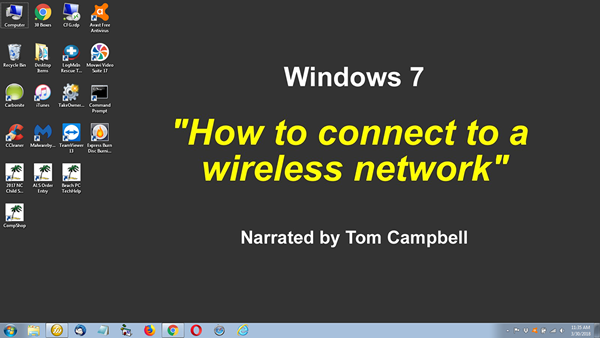 Sample Video: "How to connect to a wireless network"
Even though Microsoft has made it fairly simple to connect to a wireless network when you are using either Windows 7 or Windows 10, it can be tricky if you have recently changed your WiFi password or Router. 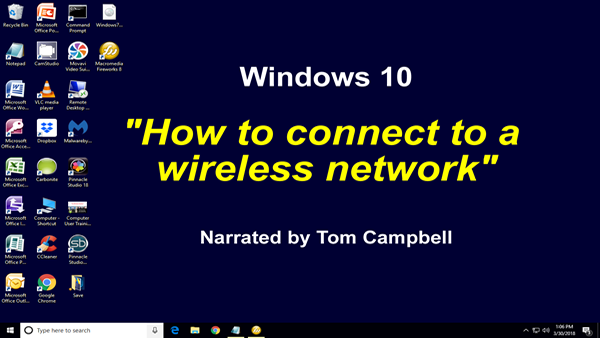 This video explains step by step how to connect to a wireless network, and how to get around the problems that might come up. Click on the image below based on the version of Windows you are using. A New Training Video every Week! At the present time, our library is very small, but we plan to add at least one new training video every week. Our initial support will be for users running Windows 7 and Windows 10, but will add support for Apple Mac users very soon. You can become a member and have UNLIMITED access to all of our current and future training videos for the introductory price of $1 per week (based on a 26 week subscription). As a member, you will receive a special login and password to gain access to the library, and we will send you a notification email every time a new training video is added. When is says "Free", is it really free? We realize that YouTube and other video sharing sites offer similar videos which can be watched for "free", but those sites are typically associated with massive advertising and multiple popups, and can install unwanted cookies on your computer without your knowledge. In addition, these "free" video sites can threaten your computer with hidden malware and viruses, and expose your computer to identity theft. We have decided to avoid these nusances, threats, and risks by charging a very modest fee to help defray the costs to produce these training videos. Your welcome. Take me to the Computer Shop Library site!